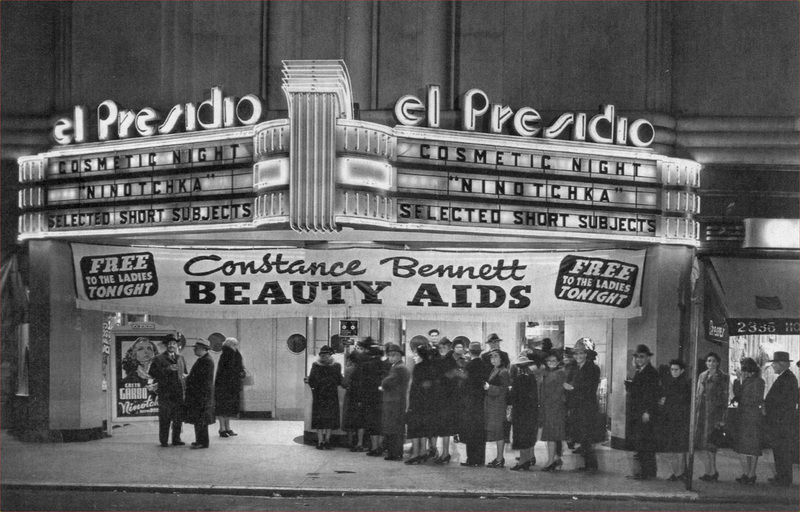 THEN: El Presidio Theatre opened on 1 July 1937; the theatre is located in the Marina District at 2340 Chestnut Street. Film star Constance Bennett's line of 'Beauty Aids' provided an inducement for moviegoers to see Greta Garbo in Ninotchka. This photo is circa 1940. 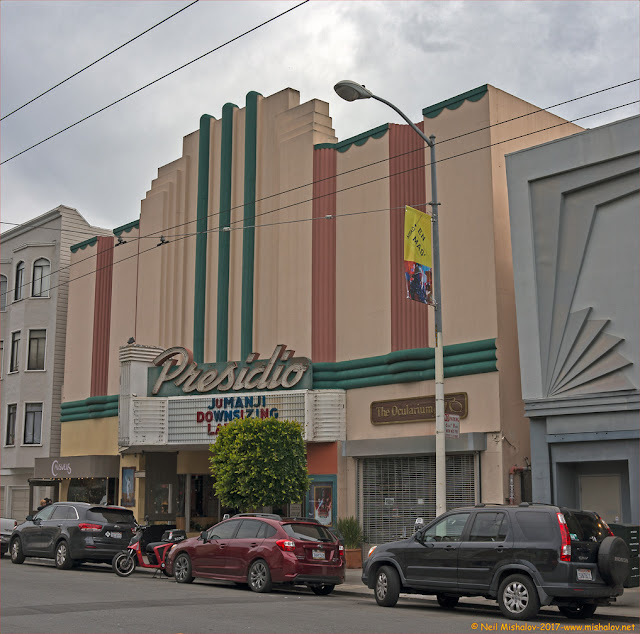 NOW: The theatre changed its name to Presidio in 1951. 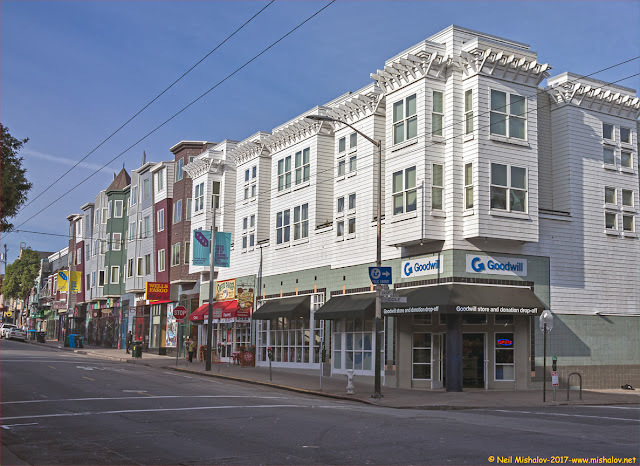 After having been closed for several months, the Presidio was reopened as a four-plex on 25 December 2004. Click Here to view a map of this location. THEN: The Four Star Theatre opened in 1913. 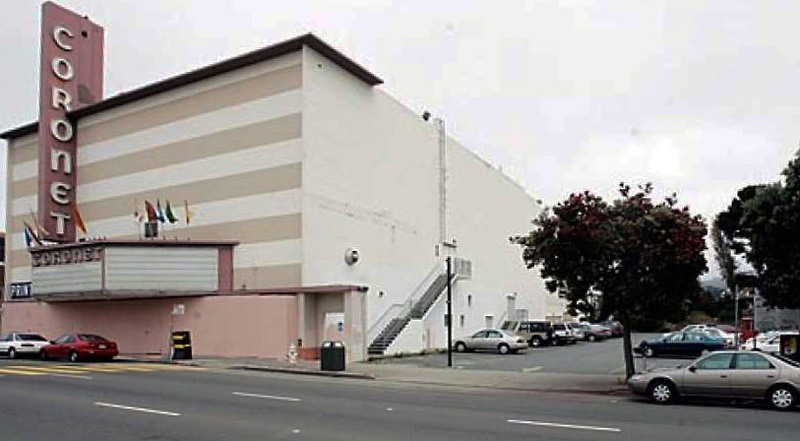 It is located at 2200 Clement Street in the Outer Richmond District. 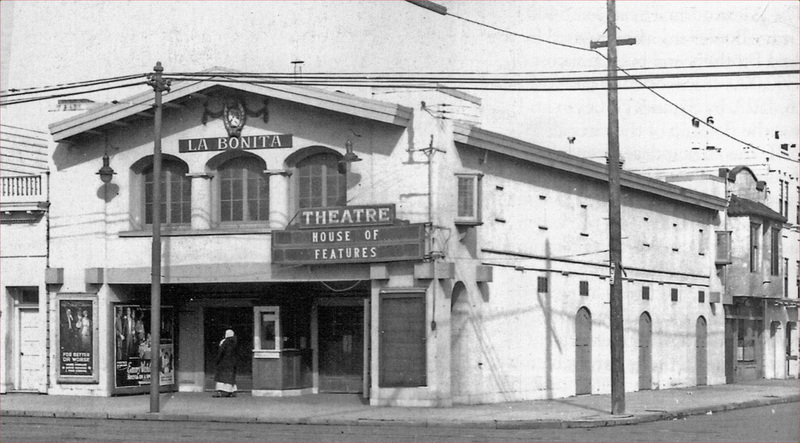 The original name of the theatre was La Bonita. 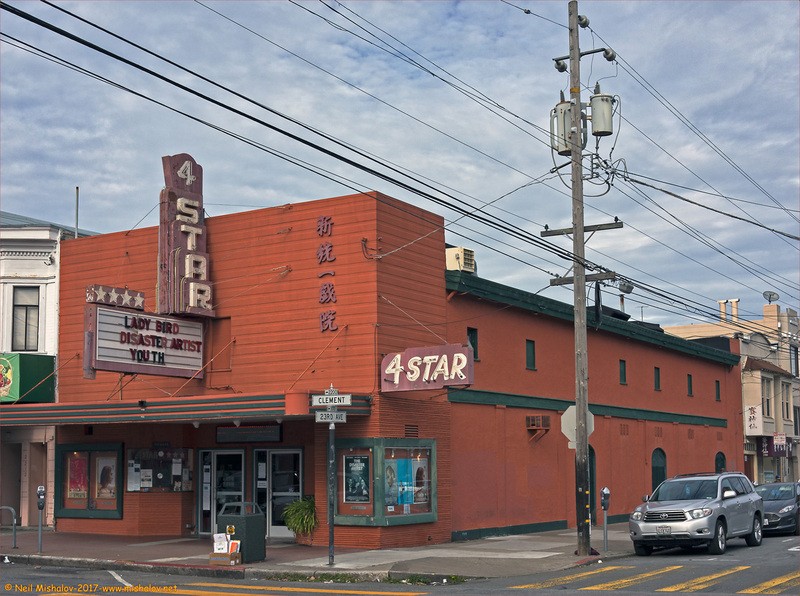 The theatre was renamed the Star Theatre in 1927, and then in 1946, the name was changed to its current iteration, Four Star Theatre. This photo was taken in 1919, and the movie playing at that time was Cecil B. De Mille's "For Better, For Worst" starring Gloria Swanson. 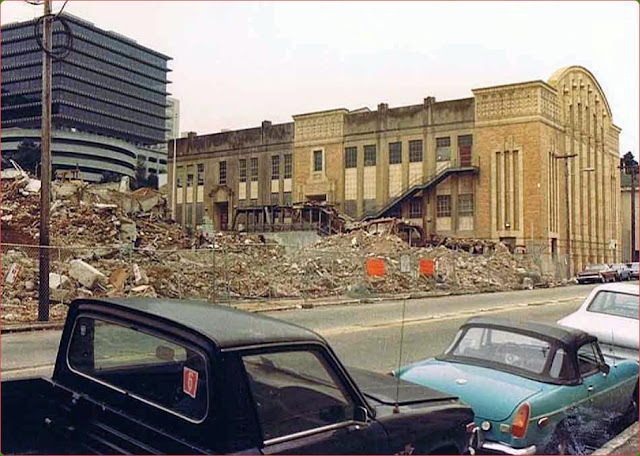 NOW: By the late 1960s, a false front hid the original facade of the building. The theatre closed in 1990, and it reopened in 1992 showing films produced in Hong Kong. Click Here to view a map of this location. 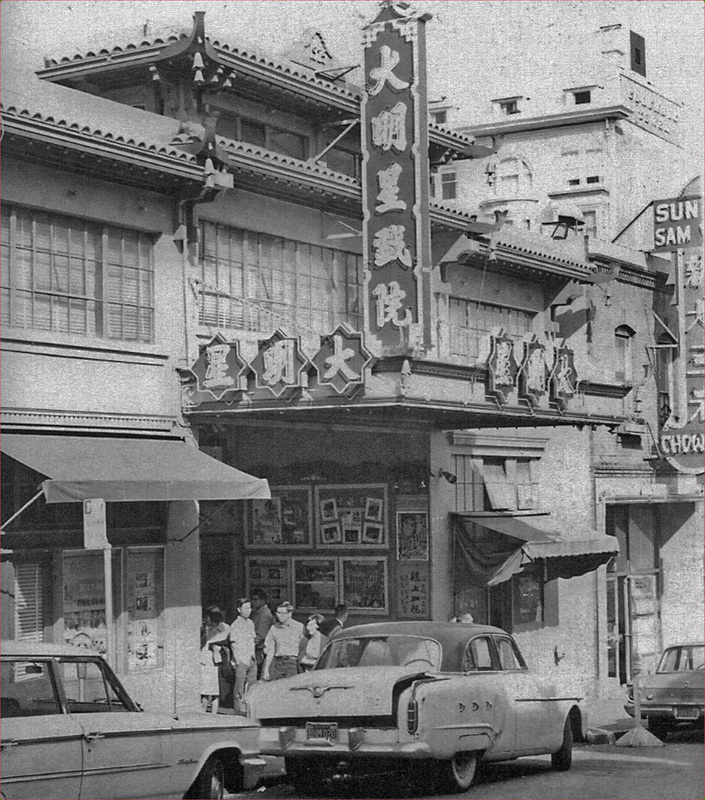 THEN: The Great China Theatre opened in 1925 at 636 Jackson Street. 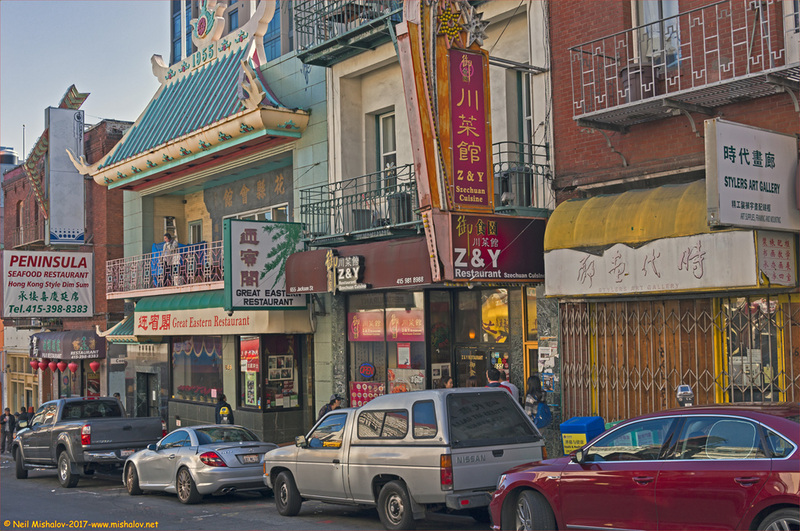 The theatre has been home to Chinese opera productions since that time. A film projection booth was added in 1940, and films were also shown in the theatre. The theatre was renamed the Great Star Theatre in 1960. This photo is circa the 1950s. NOW: In 2015, after being closed for several years, a group of investors took stewardship of the Great Star Theatre and proceeded to upgrade the building. In September 2015 a 31-year-old woman was found dead in the theatre, and one of the investors was arrested and booked into San Francisco County Jail "based on probable cause and the totality of the circumstances." The theatre has closed as of 30 January 2018. 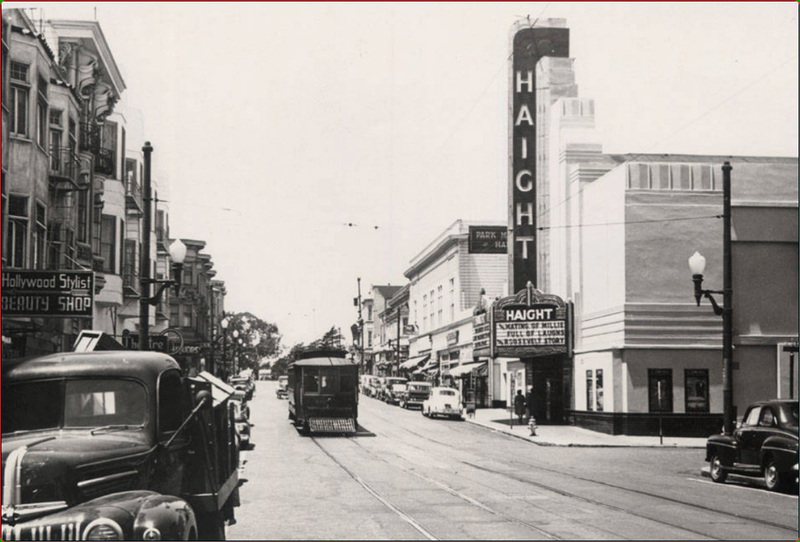 THEN: The Haight Theatre opened around 1910; it was located at 1700 Haight Street; the cross street being Cole Street. 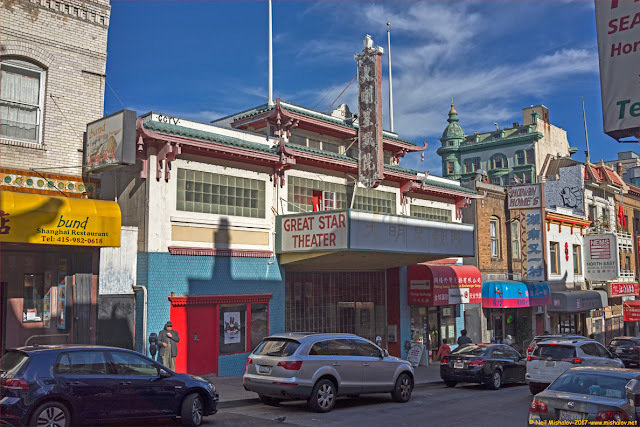 The building ceased operation as a film theatre in 1964; it then became an all-purpose venue for the Haight-Ashbury counter-culture. Go here to read the fascinating history of the rise and fall of the Haight Theatre. This photo was taken in 1948. 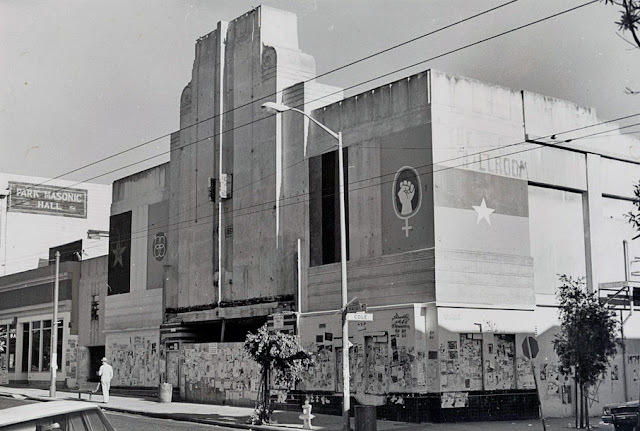 THEN: The Haight Theatre is boarded up. This picture is circa the 1970s. 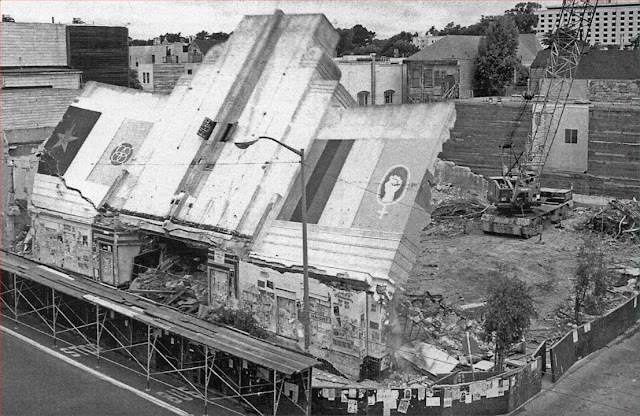 THEN: The theatre was demolished in 1979. NOW: The theatre site is currently occupied by an apartment building with two retail businesses located at street level. Click Here to view a map of this location. 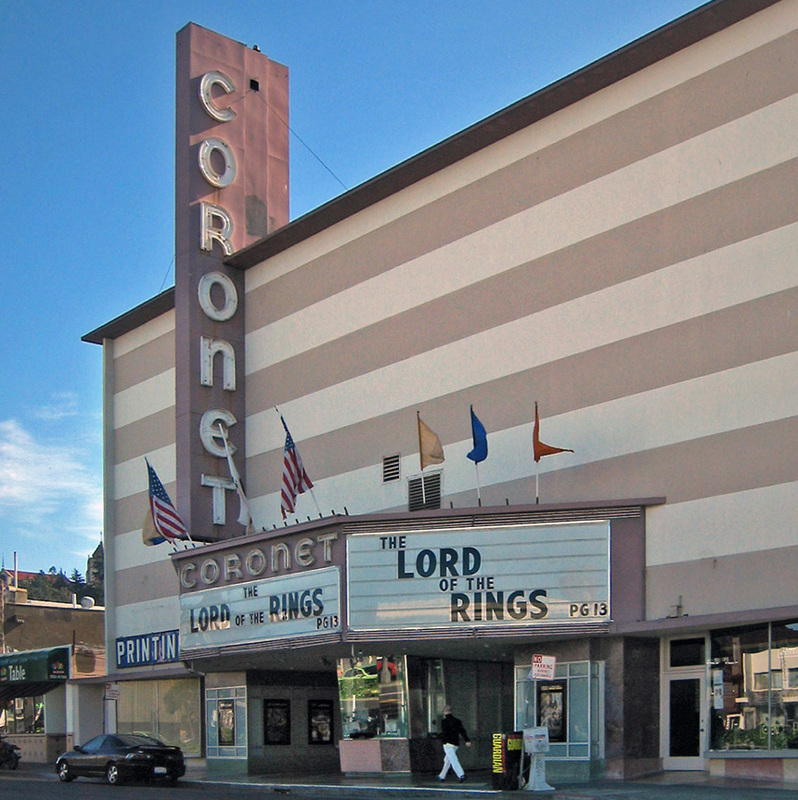 THEN: The Coronet Theatre opened on 2 November 1949 at 3575 Geary Boulevard. The theatre had a state of the art sound system, seating for 1,350 people and a gigantic screen. It was a first-run theatre, and many blockbuster movies were first shown in San Francisco at the Coronet Theatre. This photo is circa 2001. THEN: The Coronet Theatre was closed on 10 February 2005, and it was demolished during the summer of 2007. This photo is circa 2006. NOW: The site of the Coronet Theatre has been occupied by the Institute on Aging senior-care-facility since April 2011. THEN: This is a picture of Polytechnic High School. The school enrolled its first students in 1914. It was located on Frederick Street, across the street from Kezar Stadium. The boy's gymnasium, on the right, was built in 1929. The girl's gymnasium built in 1936 was located to the left of the school building and is not visible in this photograph. This photo shows a high school football game taking place at Kezar Stadium. The date of this picture is unknown. THEN: This photo was taken in 1987 as the school building was in the process of being demolished. The boy's gymnasium is seen on the right side of the picture. NOW: Both the girl's gym and the boy's gym are still standing and remain in productive use. Affordable housing condominiums were constructed on the site of the school building. Click Here to view a map of this location. 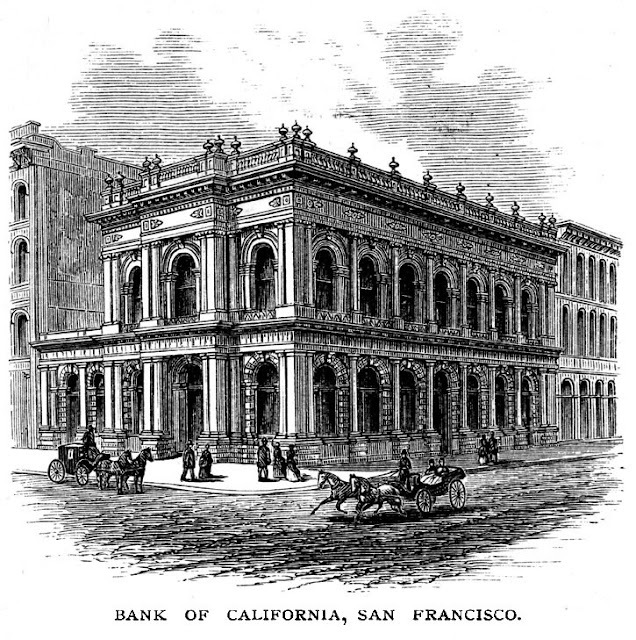 THEN: This was the original Bank of California building, it was located at 400 California Street, and was established at this site in 1864. This illustration was drawn in 1875. 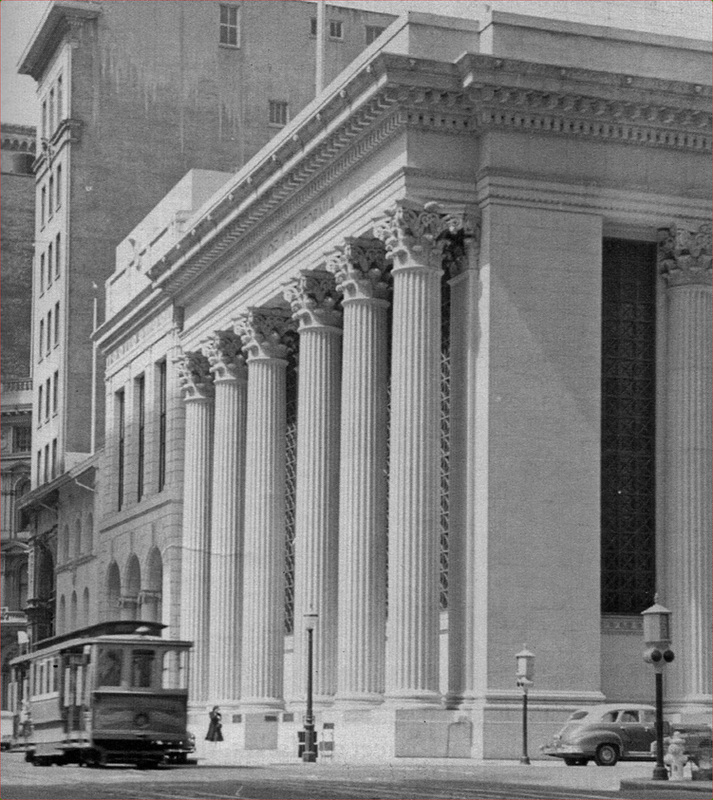 THEN: This is the Bank of California building circa the 1930s. In January 1906, the bank moved to temporary quarters while preparations for the construction of a new bank building began at this location. 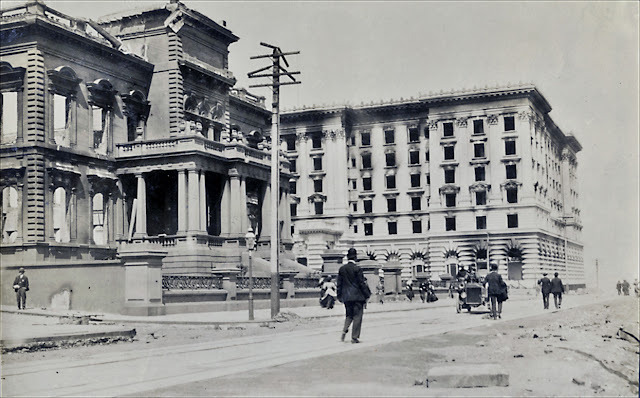 Progress was abruptly halted on 18 April 1906 by the earthquake and fire. Work recommenced six weeks later and this building opened for business on 8 September 1908. 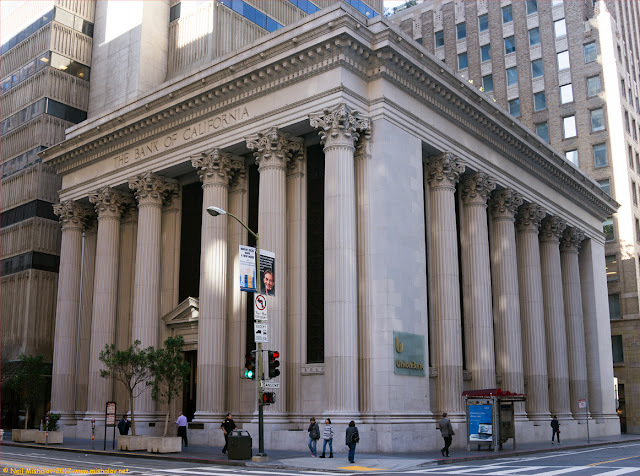 NOW: The Bank of California merged with Union Bank in 1996. The building was designated a World Heritage Site in 1968. Click Here to view a map of this location. 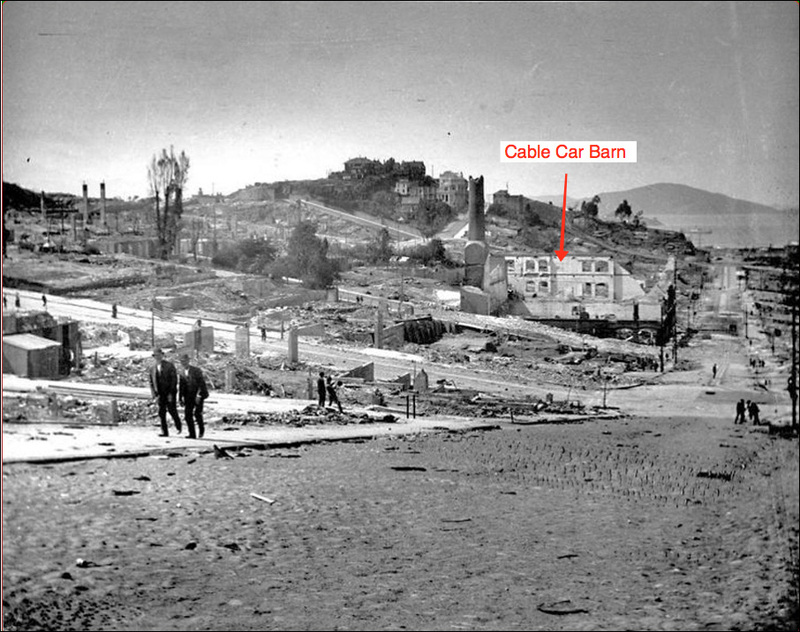 THEN: This is a view from the top of Nob Hill shortly after the devastating earthquake and fire of April 1906. 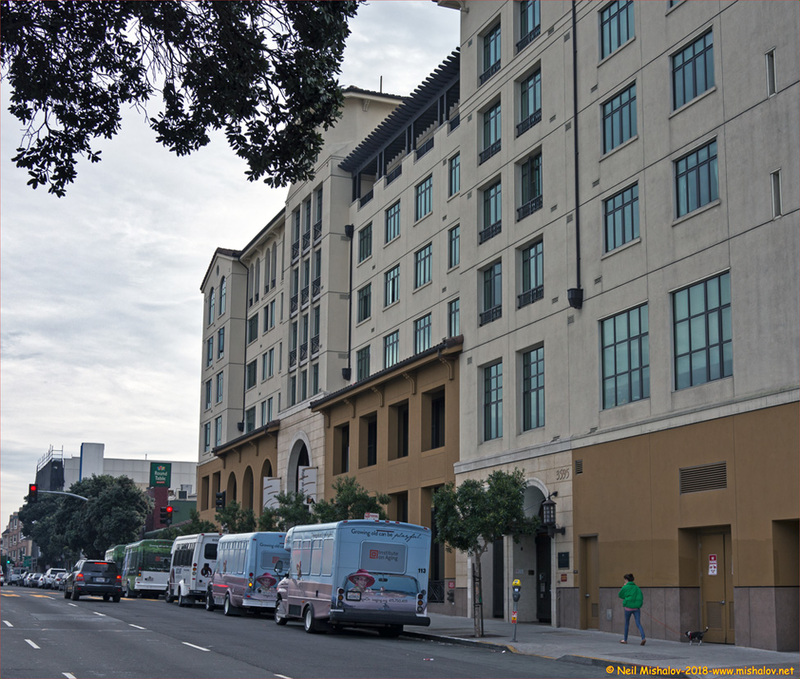 They were only two building on Nob Hill that survived the earthquake and fire. 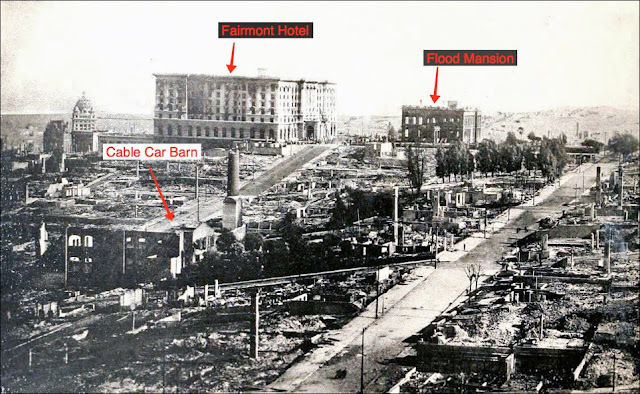 The Flood Mansion is seen on the left, and the Fairmont Hotel is seen in the background. Both buildings were burned out, but they survived complete destruction because their exteriors were built with stonework. 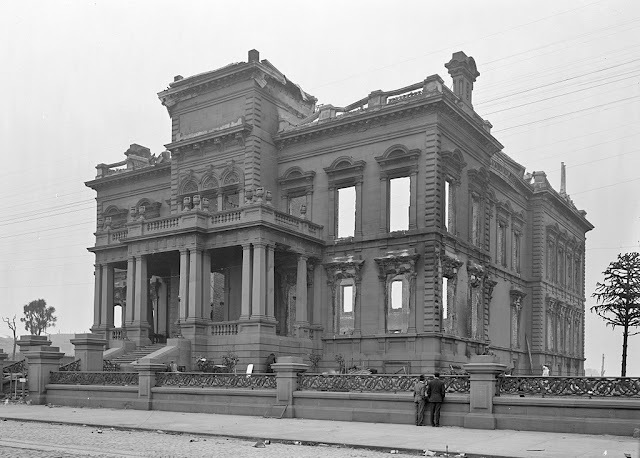 THEN: The Flood Mansion survived the earthquake and fire because of its exterior brownstone construction. NOW: This is the Flood Mansion. It was built in 1866 for James C. Flood a 19th-century silver baron who made his fortune in the silver mines of Virginia City, Nevada. 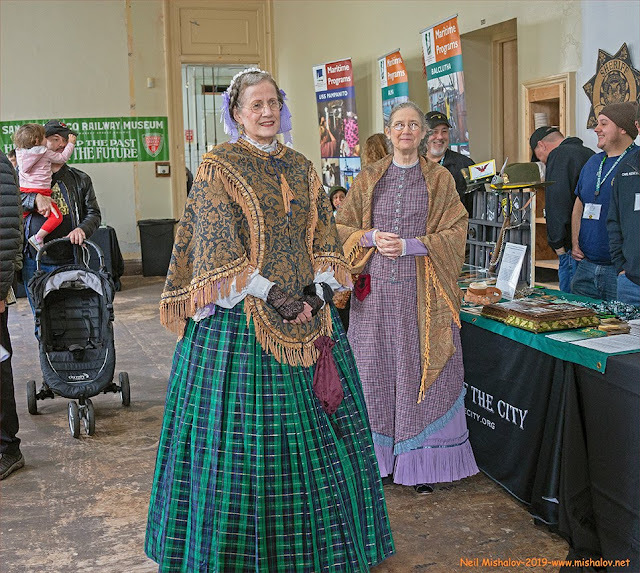 The building was the first brownstone building constructed west of the Mississippi River. The brownstones were shipped around Cape Horn from the same quarry in Connecticut that was the source for the brownstones used in the construction of buildings in New York City. 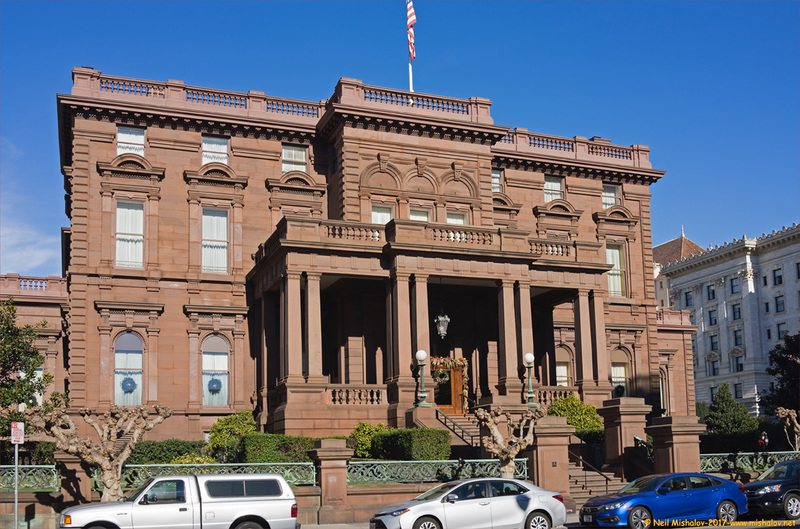 The building is now the location of the Pacific-Union Club. 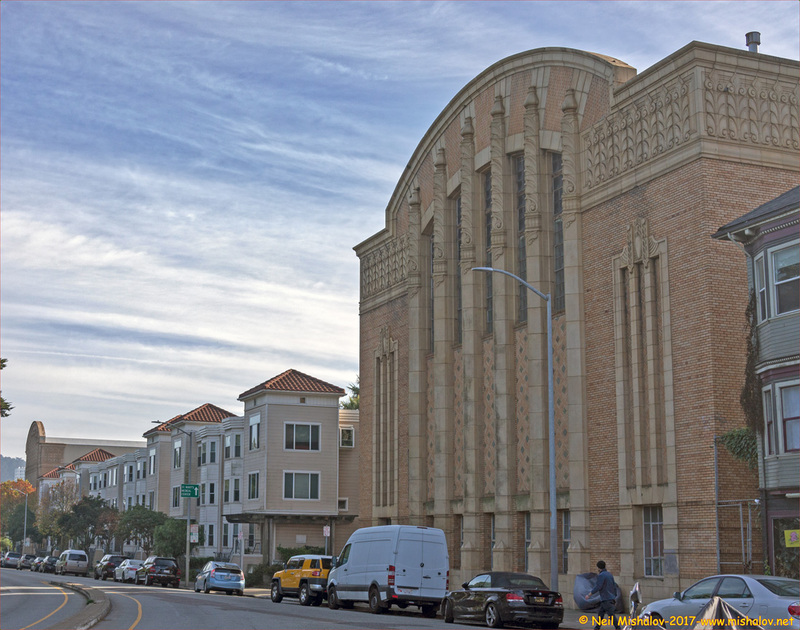 The building is San Francisco Landmark #64 and National Historic Landmark #66000230. Click Here to view a map of this site. NOW: This is a view of the Fairmont Hotel, it is located on the top of Nob Hill at 950 Mason Street. It was named for James G. Fair by his two daughters who built the hotel in his honor. 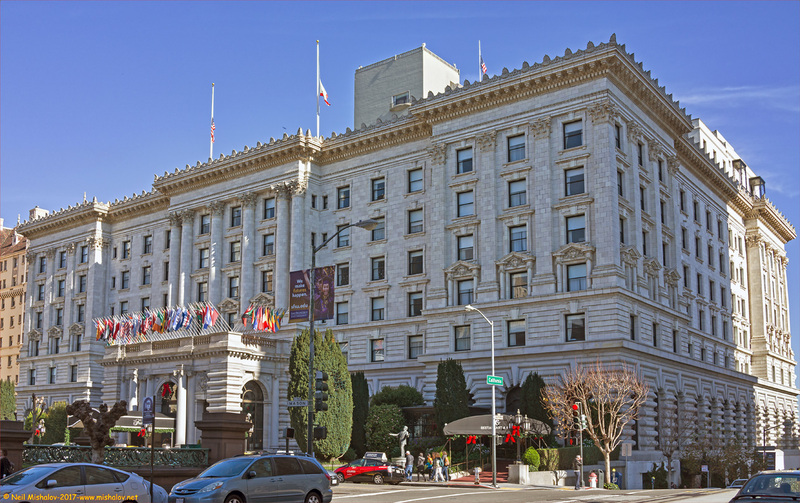 Construction of the hotel was almost completed before the 1906 earthquake. The structure survived the earthquake and fire, but the interior was heavily damaged. The hotel began accepting guests in 1907. Click Here to view a map of this location. 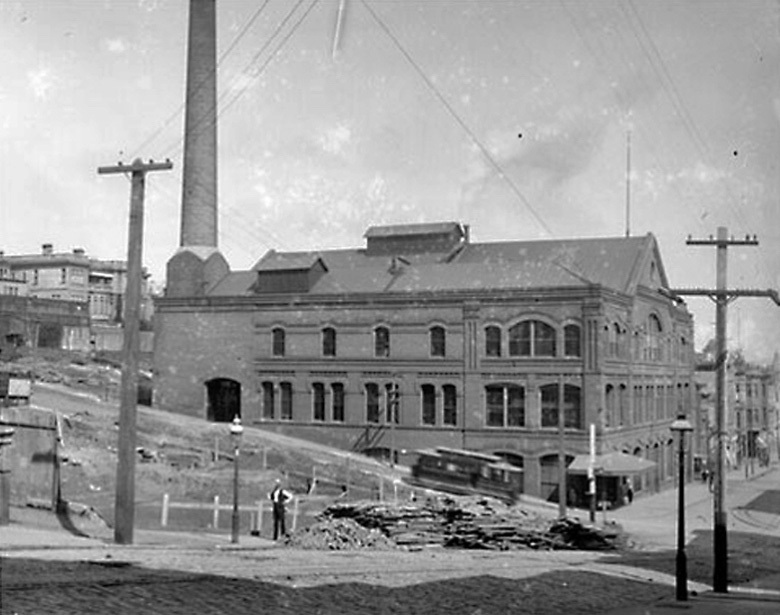 THEN: This is a view of the Mason Street Cable Car Barn and Powerhouse. The picture was taken sometime between 1887 and 1906. THEN: This is a view of the destroyed Mason Street Cable Car Barn and Powerhouse after the 18 April 1906 earthquake and fire. The view is looking north, down Mason Street. Angel Island is visible in the distance. THEN: The burned out shells of the Fairmont Hotel and the Flood Mansion are visible, as is the destroyed Cable Car Barn. This view is looking south. 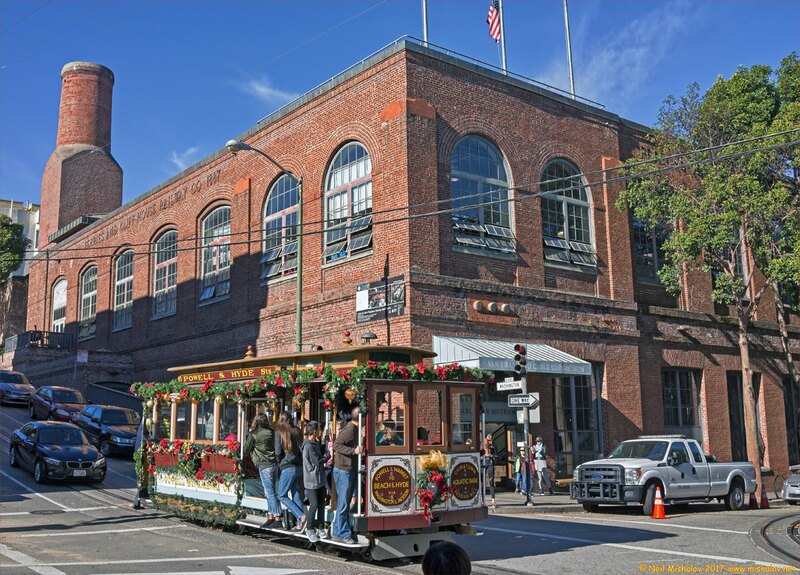 NOW: The original Cable Car Barn & Powerhouse was built in 1887 as a three-story building; it was rebuilt as a two-story structure after the 1906 earthquake and fire destroyed the original building. In addition to being a vital operating component of the three currently operating cable car lines, the building also contains a cable car museum. The remnant of the smoke stack from the original cable car barn & powerhouse is a stark reminder of the Great Earthquake & Fire of 18 April 1906. Click Here to view a map of this location. 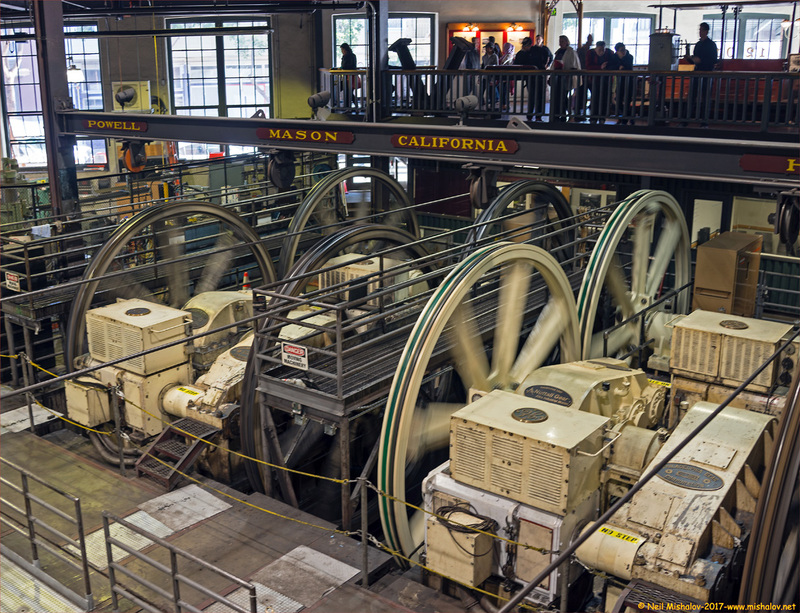 NOW: A view of the cable flywheel rotators located inside the Cable Car Barn & Powerhouse. 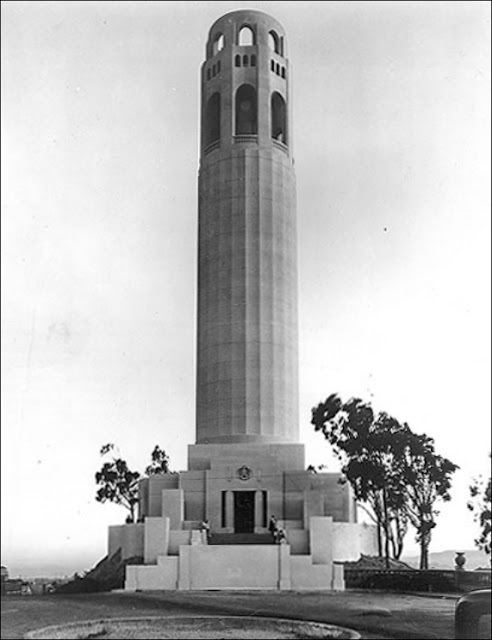 THEN: This is Coit Tower, it was built in 1933, and it is sited on the summit of Telegraph Hill. The tower was constructed thanks to a financial donation made to the City of San Francisco by the estate of Lillie Hitchcock Coit. The architect was Arthur Brown Jr. This picture is circa the1930s. 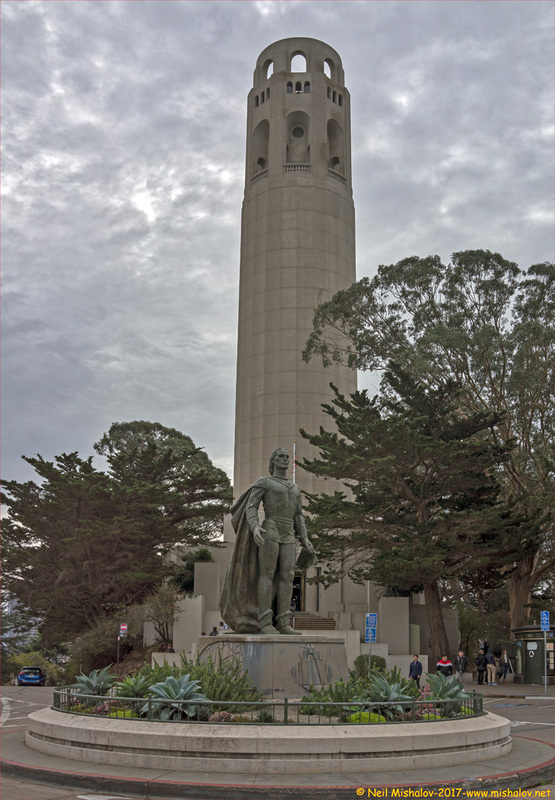 NOW: A statue of Christopher Columbus was added to the Coit Tower site in 1957. Click Here to view a map of this location. THEN: The Lincoln Park Steps was constructed in the early 1900s. 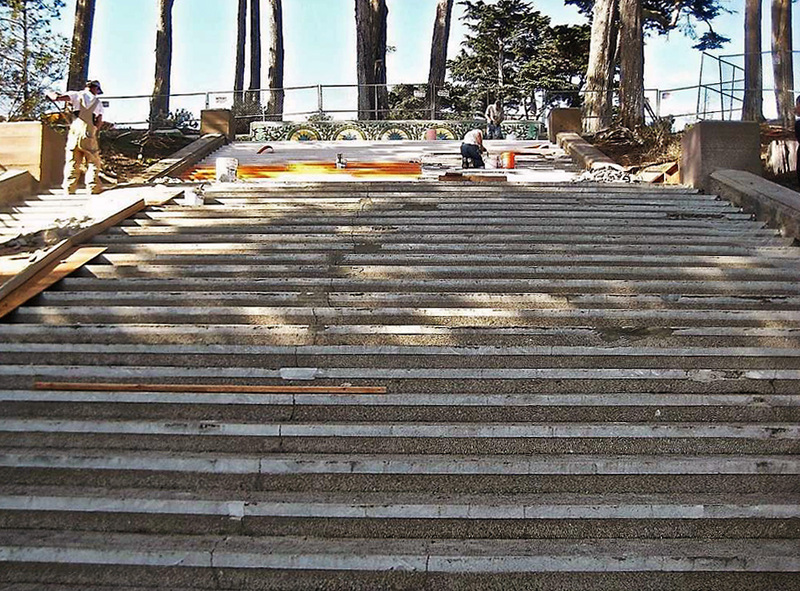 This photo was taken circa 2014 as workers prepare the steps for the thousands of ceramic tiles that will dramatically alter the visual appearance of the Lincoln Park Steps. 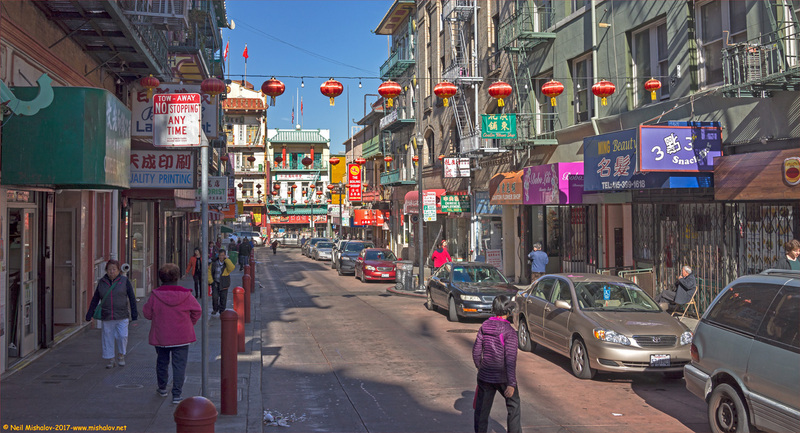 The steps are located at the western terminus of California Street. 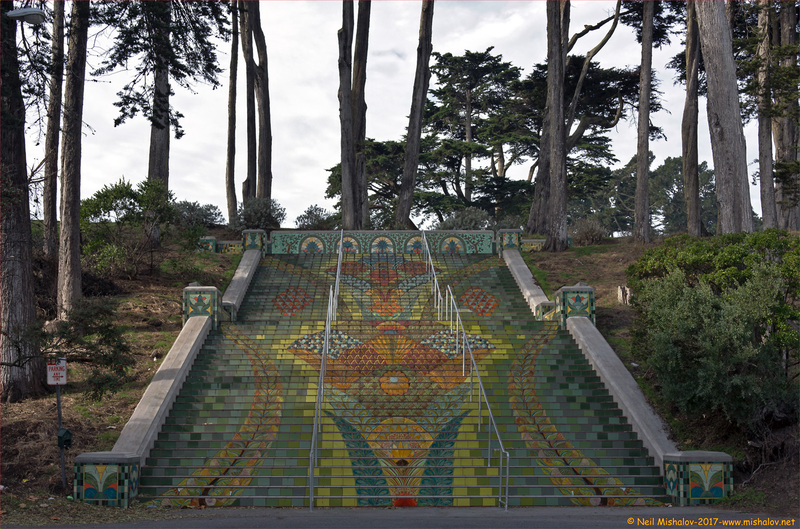 NOW: A gorgeous transformation of the Lincoln Park Steps has occurred. Click Here to view a map of this location. NOW: This is San Francisco Municipal Railway's streetcar 1009. It was built in St. Louis, Missouri in 1948. The streetcar is painted the same colors as the streetcars that operated in Dallas, Texas from 1945 to 1956. 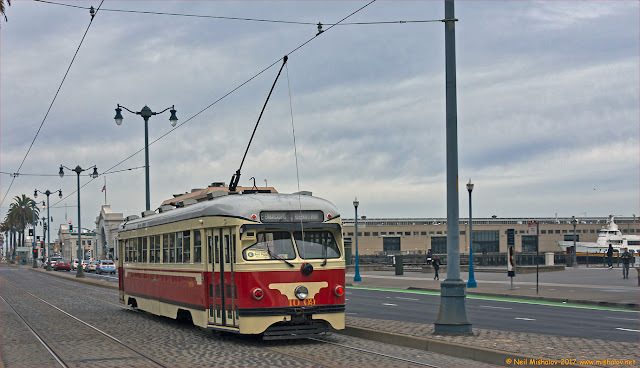 The streetcar is running on the E-Embarcadero Line and is rolling west on the Embarcadero towards Fisherman's Wharf. Click Here to view a map of this location. NOW: Here is a view of Waverley Place which is located in Chinatown. Click Here to view a map of this location. NOW: This is a view of Z&Y Restaurant; the restaurant is located at 655 Jackson Street. Z&Y Restaurant has a well-deserved reputation as a Szechuan cuisine restaurant that serves deliciously spicy food. Click Here to view a map of this location. 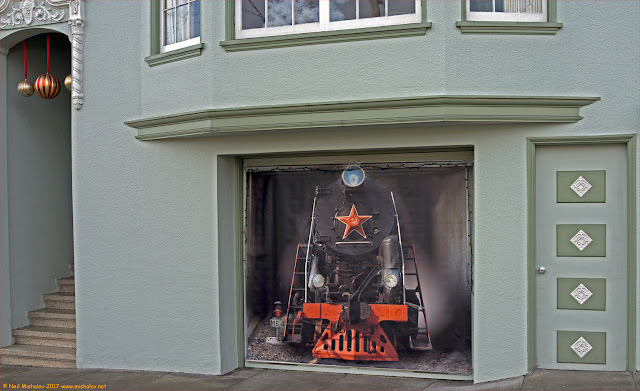 NOW: This is an unusual sight, a drawing of a Russian Soviet-era steam train occupying the garage door of a house located on California Street near Thirty-first Avenue in the Outer Richmond District. All aboard! Click Here to view a map of this location. 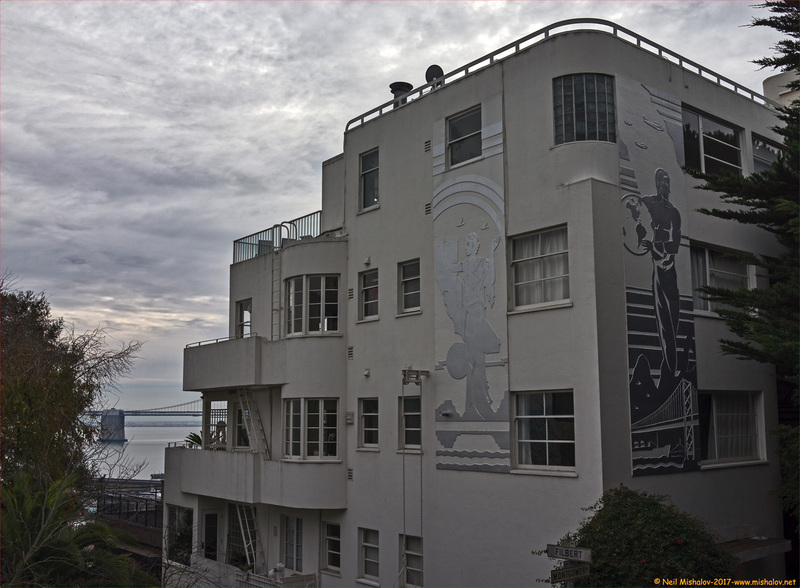 NOW: This apartment building is located on Telegraph Hill, adjacent to the Filbert Steps. The building is known as the Malloch Building, and it was constructed in 1937. The building and the Filbert Steps were both used as filming locations in the 1947 movie Dark Passage starring Humphrey Bogart and Lauren Bacall. Click Here to view a map of this location. 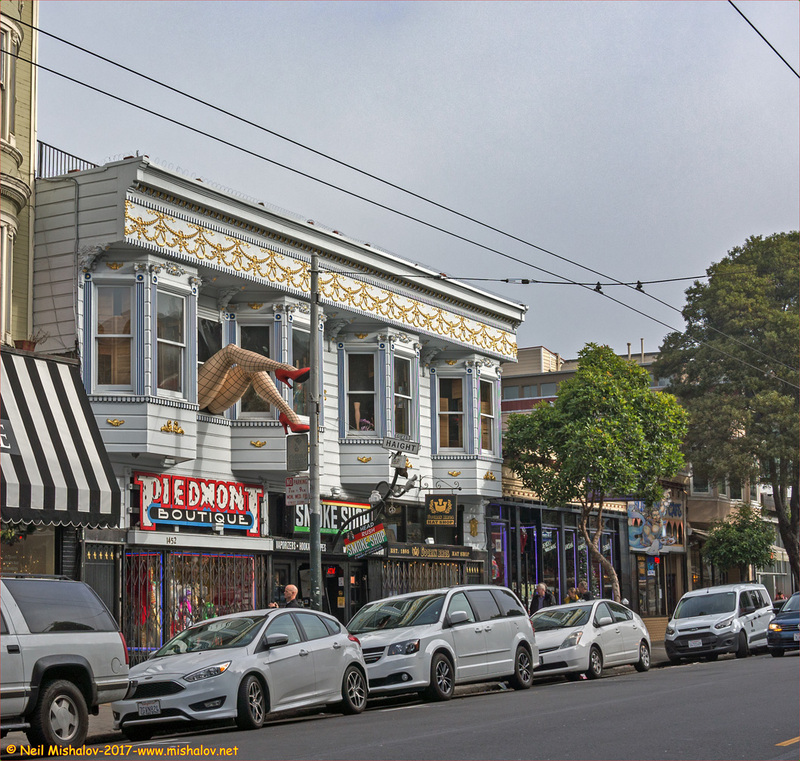 NOW: A view of Haight Street in the Haight Ashbury District of San Francisco. Click Here to view a map of this location. 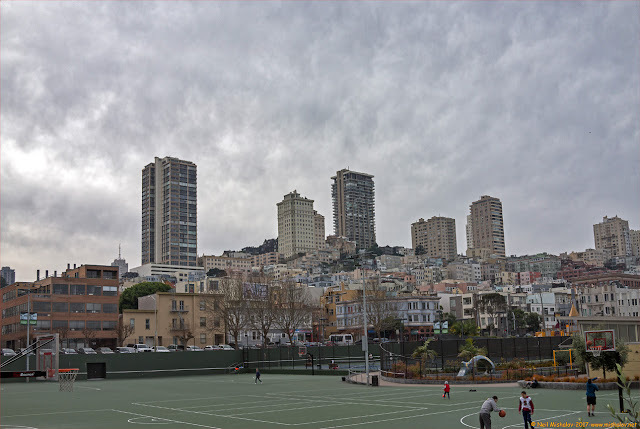 NOW: Here is a view of Nob Hill as seen from the Joe DiMaggio Playground which is located in the North Beach neighborhood. Click Here to view a map of this location. NOW: This is a view of downtown San Francisco as seen from the Embarcadeo; the view is looking southeast. 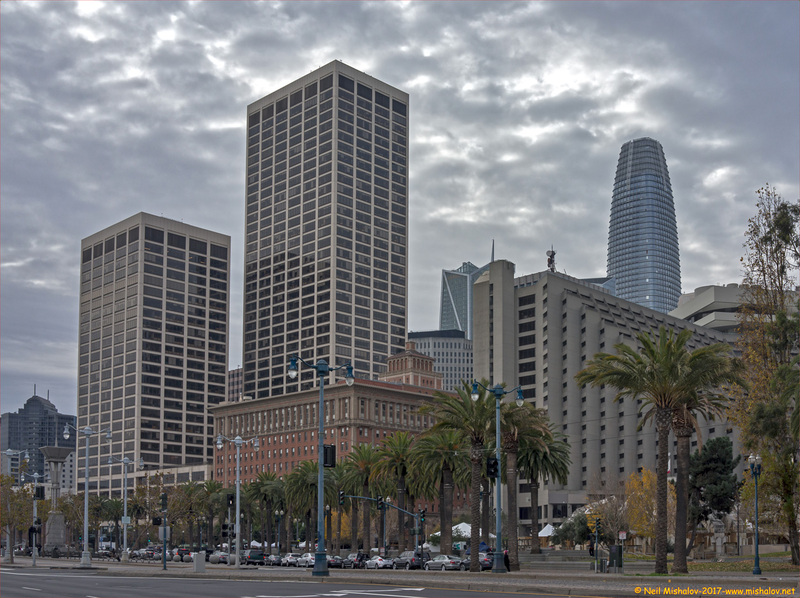 The newly constructed Transbay Tower, also known as Salesforce Tower, is the building on the right. It is now the tallest building in San Francisco. Click Here to view a map of this location. NOW: This is one of ten stagecoaches built in 1867 for Wells Fargo by the Abbot-Downing Company of Concord, New Hampshire. These stagecoaches were each capable of carrying eighteen people - nine inside, three on the driver's seat and six people on top of the coach. This stagecoach initially served on Wells Fargo's overland mail route. After which, it ran between Santa Clara and Santa Cruz, California in the 1870s. Wells Fargo then sold the coach. 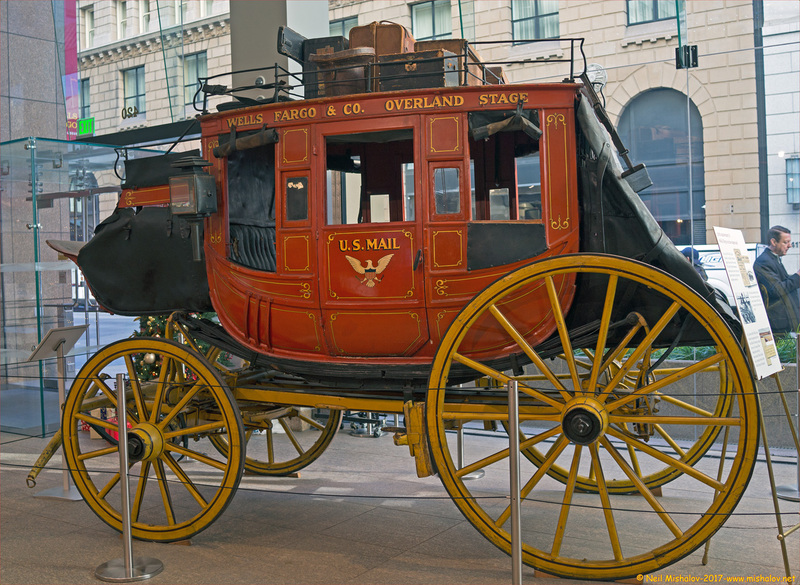 In 1928 Wells Fargo repurchase the coach, and the coach now has a prominent position in the Wells Fargo History Museum. The museum is located on Montgomery Street. Click Here to see the location of the Wells Fargo History Museum on a map.